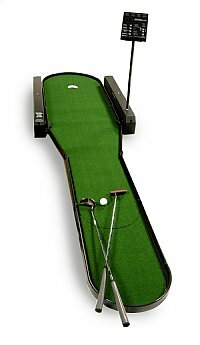 The Golf Putting Challenge Rental offers 4 different 18 hole courses. Two of the courses are designed for a more experienced players and the other two courses are for amateurs. Each hole on the individual golf putting challenge rental changes its contour & terrain thus recreating putting experiences on the golf courses. The golf putting challenge has an authentic true to life putting surface. Up to 4 players can play and the display on the golf putting challenge announces each player's turn, the hole number, penalty strokes and average putts per player. It also keeps a running calculation of each player's score. The golf putting challenge is a great addition for companies that have a standard size trade show booth and want to provide a promotion element to their trade show booth. Since the putting challenge is quite quick to play, companies at their respective trade show booth can operate promotions and not have to worry about a long line. The golf putting challenge rental has an automatic ball return that rolls the golf ball back to the player's feet after every putt. Contact a WOW Entertainment event specialist at 800-WOW-1196 to learn more about this item as well as other golf party rentals.